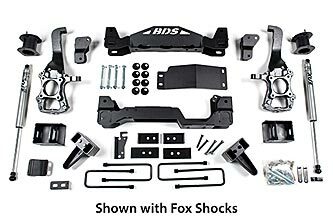 BDS Suspension is now shipping a full line of suspension systems for the 2017 Ford F150 2/4wd trucks. Available in 2.5", 4" and 6" lift heights with options FOX 2.5 coilovers, BDS Suspension offers suspension options to meet your needs and clear up to 37" tires. 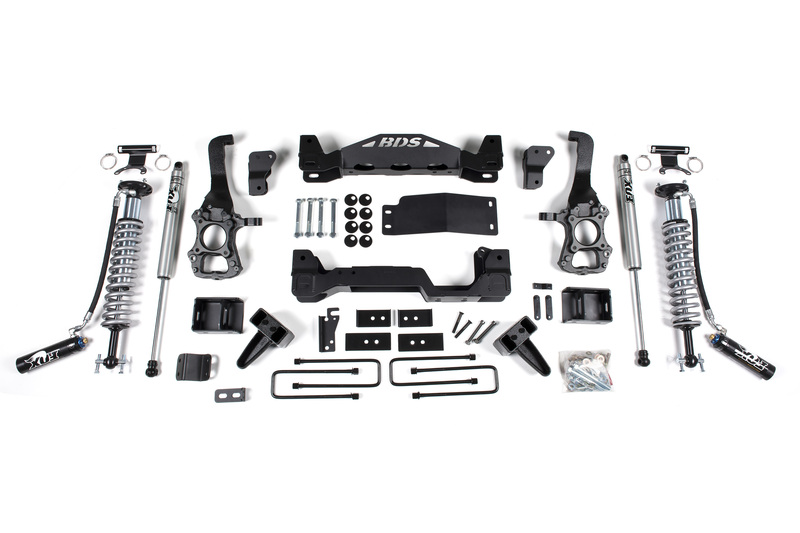 These 4wd kits are based off the 2015-2016 Ford F150 4wd systems, but use new front diff drop brackets to optimize front driveline angles and accommodate the new transfer case options on the 2017 models. 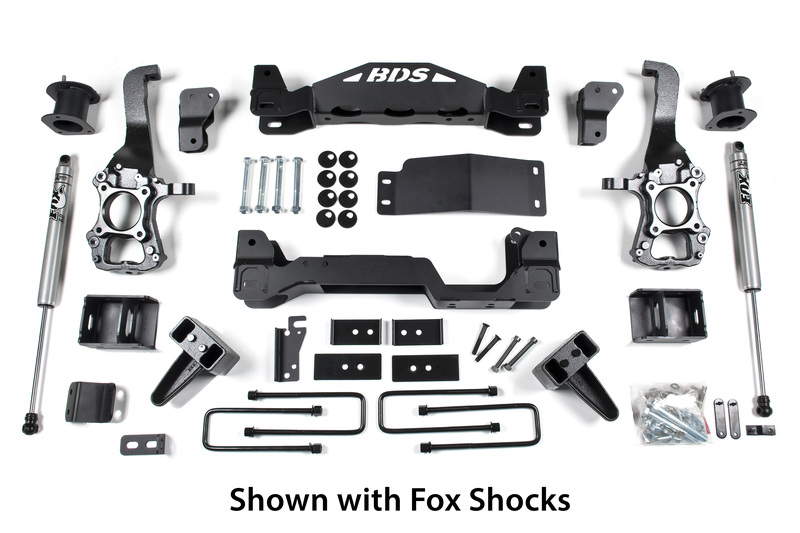 As with all BDS kits these include Factory Protection Plus, offering you BDS's No Fine Print Warranty, FMVSS No.126 ESC System compliance, and a 5-year 60,000-mile drivetrain protection. Improve your 2017 F150's performance, capability, and curb appeal BDS. 2.5" Leveling Kit: If you're looking for that extra boost to fit larger tires and eliminate the factory nose low rake of your F150 than the BDS 2.5" leveling kit is just the ticket. The kit integrates a new top mounted strut spacer in combination with a pre-load spacer to raise the front end while improving the handling and stability. 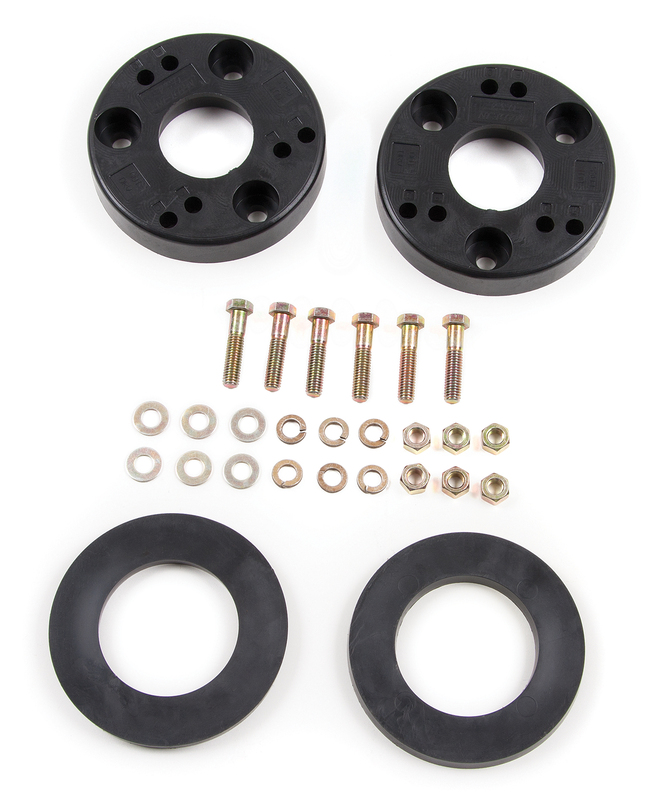 This 2-piece strut spacer system is designed to allow the suspension to fully cycle through wheel travel without maxing out the upper ball joints as is the case with taller 1-piece strut spacer leveling kits on the market. 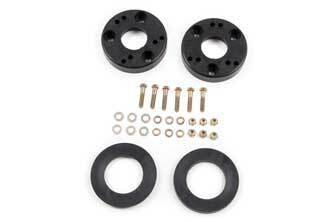 An optional 1" rear block kit and rear shocks are also available, this kit allows for up to 35" tires to be installed. 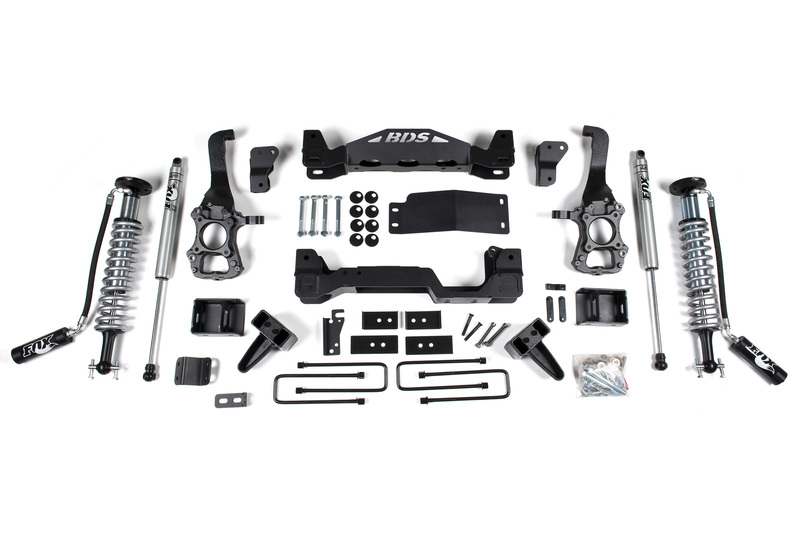 4" and 6" IFS Lift Kits: These new lift systems are based off the tried and true 2015-2016 BDS IFS kits, but have been redesigned to fit some of the updated features of the 2017 F150s. These new lift kits are engineered to the highest standard, using quality materials built right here in the USA. The kit offers a smooth ride and reliable on-road handling coupled with impressive off-road performance and clearance for larger tires. The 4" and 6" systems utilize high clearance one-piece laser cut 1/4" steel crossmembers, CNC-machined ductile iron steering knuckles, a new multipoint differential relocation brackets, heavy duty differential skid plate, 4" or 6" upper strut mount spacers to retain the OE ride quality, sway bar relocation brackets, new alignment cam bolts, and a billet aluminum driveshaft spacer. In the rear a taller lift block and new u-bolts is supplied to replace the factory 1.25" block to eliminate stacking blocks while leveling the stance. Rear brake line extensions and your choice of rear BDS-5500 series or Fox 2.0 shocks round out these kits. The 4" system allows for up to 35" tires to be installed while the 6" system fits up to 37" tires. These lift kits have been designed, tested, and independently confirmed to integrate flawlessly with the new electronic stability control (ESC) systems and meet FMVSS No.126 compliancy safety standards. 4" and 6" Performance Coilover Systems: The 4" and 6" performance coilover systems bring together the strength and capability of the BDS IFS kits with uncompromising performance of FOX factory series 2.5 remote reservoir coilovers and rear Fox 2.0 IFP shocks for true blend of on-road comfort and offroad performance. 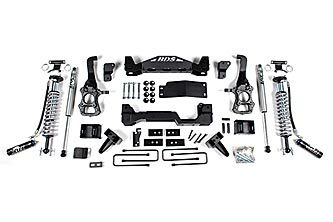 These systems include all the components of the standard 4" or 6" IFS systems with heavy duty high clearance crossmember, ductile iron steering knuckles, differential skid plate, sway bar relocation, diff relocation and more. In place of top mounted strut spacers and rear BDS-5500 series shocks these systems use FOX factory series 2.5 remote reservoir coilovers and rear 2.0 IFP gas shocks for exceptional performance and ride quality on any terrain. These coilovers offer vastly superior dampening for impressive capability to soak up the harshest terrains offroad while offering comfort on your daily commute. They feature a smooth bore and honed seamless alloy body, 7/8" hardened stainless steel shaft, FOX coil springs, black anodized machined 6061-T6 billet aluminum mounts and remote reservoir. The coilovers come fully assembled, preset for 6" of lift right out of the box. Preload adjustments can be made using the #129600 spanner wrench available separately. These coilovers are designed for easy bolt-on installation and include a top reservoir mount. 4" & 6" DSC Coilover Systems: These kits up the ante of the performance coilover system with FPX 2.5 factory series coilovers featuring DSC (Dual Speed Compression) adjustments to dial in your suspension's performance for any terrain. These coilovers feature a smooth bore and honed seamless alloy body, 7/8" hardened stainless steel shaft, FOX coil springs, black anodized machined 6061-T6 billet aluminum mounts and remote reservoir with DSC adjustment technology. The DSC adjustment allows for easy tuning of the vehicle’s suspension compression dampening to dial in the ideal ride performance to soak up the bumps, both large and small. The DSC has 12 adjustment points for the high-speed compression as well as 10 adjustment points for the low-speed compression allowing you to make large or small changes to further improve your performance for your particular needs. 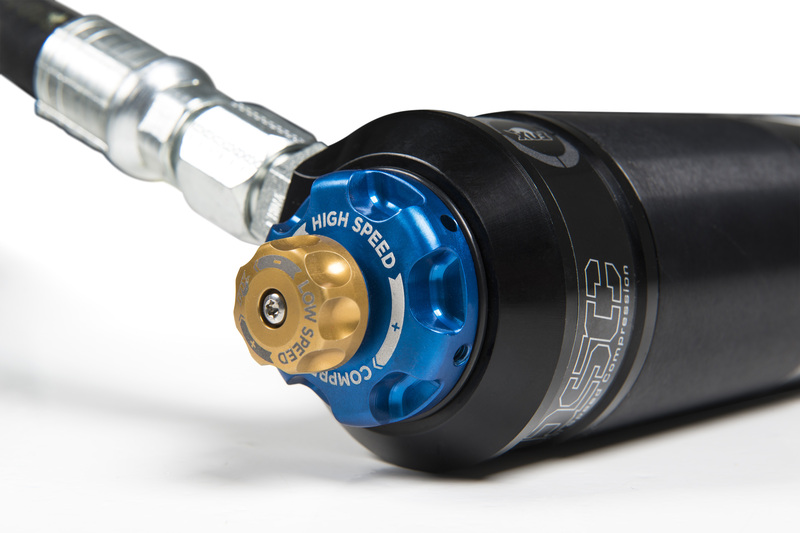 Adjustments can be made by simply twisting the "blue" high speed and "gold" low speed compression knobs located on the end of the remote reservoir of the FOX 2.5 coilovers. No tools or shop adjustments needed, allowing you to tune the suspension out on the trail. The coilovers come fully assembled, preset for 6" of lift right out of the box. Preload adjustments can be made using the #129600 spanner wrench available separately. These coilovers are paired with the rear FOX 2.0 shocks for improved performance. Get the most of out your new 2017 F150 with BDS Suspension.